The oranges and reds of autumn whisper of the coming cold. The door to winter takes us through the dark season of late October and early November. Halloween pales in comparison to the real horrors of this time of year – horrors that make zombies and other assorted beasties, serial killers, etc. look like the cast of a My Little Pony DVD. I’m talking about the sinister festival of “Lifeschplatten”. Unknown in the culture at large, “Lifeschplatten” thrives in the university subculture and centers around the sadistic rite of midterms. The name derives from a German word describing the sound of GPA’s hitting the ground like pumpkins dropped from the roof of a five-story building. Students geeked into cramming frenzies by their own procrastination and pressure for grades gorge with information often starving themselves of sleep. Throw in twelve gallons of all forms of liquified caffeine or energy drinks. Some even toss Adderall and other “smart drugs” into this midterm microbrew. In this condition, which makes your average zombie look like a Nobel Prize winner, the student enters the midterm stuffed to the gills with info which they will disgorge into papers and test booklets. The rare photo above captures students caught up in the frenzy of “Lifeschplatten” (No university students were harmed in taking this photo.). 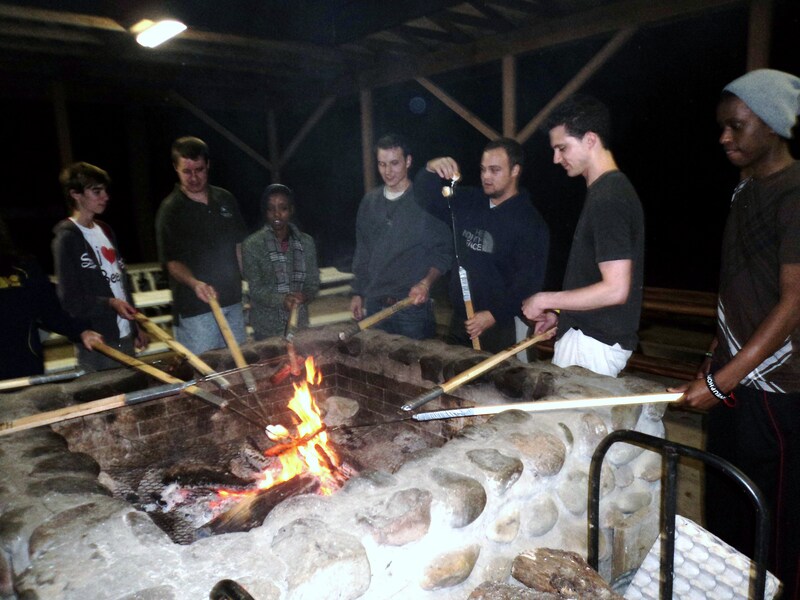 The fire they use to roast hotdogs and make smores comes from burning midterm exams and research papers. See how they discuss and smile in anticipation of drying cars in car washes while enrolling in online classes from a school in somebody’s basement. How can we (more specifically, you) put an end to the autumn midterm horrors of “Lifeschplatten”? The year round cure is simple – study and work smart. We do something very good to and for ourselves when we study. I’m not a secularist; it is no cosmic accident we have brains. They can do a lot more than serve as neurological filing cabinets for midterm. Jesus Christ living in us through God’s Spirit should make us better thinkers. People noticed that right away about the first followers of Jesus who never cleared the admission hurdles at our school (See Acts 4:13). Working the muscles of our brain in study does good things for us spiritually (Romans 12:1-2). That includes the classes we don’t really like but may have to take. Very little of life consists of getting what we want when we want it and how we want it. We have to do things we don’t like – boot camp preparing us for life. Setting a life trajectory of mental laziness during college years will reap a bitter harvest – empty head, empty life. Besides, Jesus Christ stands over all creation. That means He loves the subjects we’re not interested in. And if He loves it, we should give it a decent shot. When He works in a life, Jesus leaves no scraps, nothing is wasted. Seeing His fingerprints on every dimension of human endeavor will grow vision of life that has depth and fire and the savor of Jesus Himself about it. So study. Interruptions! The “Lifeschplatten” Gestapo send their people running through dorms during midterms where they fling open as many doors as they can yelling,”Hey, who wants to run out for a pizza?” “You need a break. Let’s head up to The Strip and see what’s going on.” Not only do we lose the time away from the studies but we also tack on the added time it will take to refire our concentration. Find a friend who will fasten us to our chair with a hot glue gun – whatever it takes but stay in the saddle! Make signs for your room. ANYONE ENTERING THIS ROOM WILL BE DEVOURED BY TURKEY VULTURES. Or PIZZA?!? PIZZA?!! WE DON’T NEED NO STINKING PIZZA!!! Meddling film buffs will recognize this as a gloss from a Humphrey Bogart film, think that we are cool and retro and leave us alone. It’s a win-win. Ah, Facebook! To paraphrase Jesus very loosely, “If your mouse finger cannot leave Facebook alone and persists in wasting one or two hours at a time either talking about nothing or putting up barns on somebody’s farm, cut it off.” Okay, that’s not what Matthew 18: 7-9 says but the point remains. Study with both hands stuffed inside our mouth. Wear one shoe over each hand. Drop the mouse and step away. “Study to show yourself approved of God…” (I Tim 2;15) as well as by profs, T.A.’s, various and sundry grading assistants and Godspeed you through midterms and around academic probation postings. I do need to say that the students pictured above are NOT burning old midterms. They attend Michigan State, the University of Michigan and Western Michigan University and were trapped with me in Michigan’s north woods at a retreat some weeks ago. Coyotes howled most of the night but carried no one off so it was a great weekend. Please return your seats to the upright position, hand your night vision goggles to the attendant and exit to the rear. See you next post at geezeronthequad.com.